LANDSCAPERS BULK LOT 100 plants. 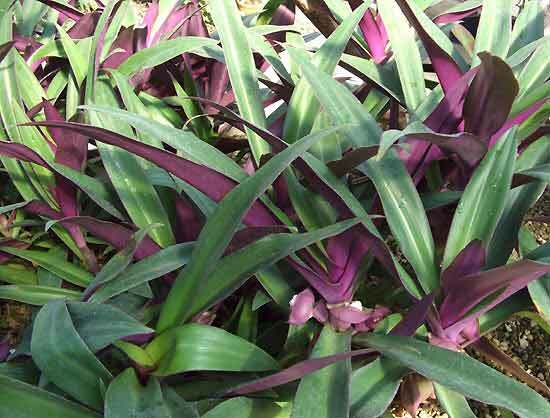 Rhoeo is a short-stemmed tender foliage plant which makes attractive small, dense, clumping rosettes. It forms a solid groundcover of upright purple and green leaves. The 15cm to 20cm long, sword-shaped leaves are green above and purplish below. The unusual flowers, borne down among the leaves, appear as clusters of tiny white flowers nestled within two boatshaped, purplish bracts. They are not noticeable unless you look closely. Also commonly known as Moses in the bulrushes, Moses in the boat. Various scientific names too: Tradescantia spathacea, Rhoeo bermudensis, R. spathacea nana.